This handmade leather padfolio is compatible with iPad Pro 12,9 & Surface Pro and all Letter size and A4 size notebooks.It protects and organize your all EDC essentials. 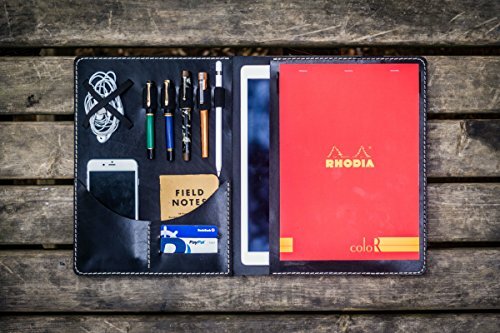 This leather portfolio has 4 elastic pen / pencil loop and an Apple Pencil holder.Also there are two credit card slots, two small pockets for your phone and your small notebooks, an elastic storage for cables, earphone cords or power adapter. It comes with two different elastics to attach the notebooks.You can use both vertical or horizontal notebooks in Letter or A4 sizes. Both interior pockets can be used for iPad Pro or Surface Pro.Also you put your iPad Pro 12,9 with Apple Smart Keyboard. The cover has an elastic band closure that wraps around the left side of the cover. It is easier to open and close it. However the elastic for around the case keeps your notebook & technology secure. *Notebook is not included. If you have any questions about this product by Galen Leather, contact us by completing and submitting the form below. If you are looking for a specif part number, please include it with your message.